CHRIST’S FESTIVAL Quinquennial Festival in honour of the Divine Crucifix in Pove del Grappa: two Processions with more than 640 people in period costume, biblical scenes and the performance of Christ’s Passion are its main events. The Christ’s Festival in Pove del Grappa, village on the slopes of Mount Grappa nearthe Valsugana, has a bicentenary tradition. The first historical mention dates back to 1795 when the inhabitants of Pove ask for help to their Crucifix in a period full of sacks. Since then, first with an irregular frequency and then every five years (in the years which end by 0 or 5) the Festival has evolved a lot. The main event during the Festival is the procession with more than 640 people in period costume representing the characters of the Old and New Testaments. All the inhabitants are engaged in the organization of the Festival, not only to play a role in the procession but also to deck out streets with arches, lights and decorations. Every detail, from the costumes to the shows, is supervised with meticulousness and voluntarily by the inhabitants. Another important event is the performance of Christ’s Passion with more than one hundred actors while the biblical scenes along the streets of Pove represent the main episodes as narrated in the Bible. There are also shows and plays and debates during the two weeks, but the main reason of the Festival is always the same: the Divine Crucifix. According to the tradition, it was carved by an Austrian or Bohemian pilgrim in the fifteenth century as a sign of gratitude to the priest who had given him hospitality during his voyage to Rome. In our web site (www.festedelcristo.com) you can find all the details of our programme for the next edition in 2015. The two Processions will be on September 6th and September 13th on Sunday afternoon, while the performance of Christ’s Passion will be on September 11th in the evening.To watch the Processions you have simply to find a place along the streets through which they will pass without paying any ticket, while you can find all the details about the performance of Christ’s Passion in our web site. 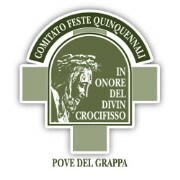 The Quinquennial Festival in honour of the Divine Crucifix, also called the Christ’s Festival, has been taking place since 1795 to bring honour to a wooden Crucifix which, according to the tradition, was carved by a pilgrim as a sign of gratitude to the parish of Pove del Grappa, a small village on the slopes of Mount Grappa, near the Valsugana.Two processions with more than 640 people in period costume, biblical scenes and the performance of Christ’s Passion are the main events. Starting from 1795, with the arrival to the village of both the Austrians and the French, Pove begins its own ordeal: its inhabitants are subjected for many years to many sacks and thefts which, with only a few truces, last till 1813. In the 1797 chronicle of Pove Town Hall we can read that “it is necessary to clean the streets for the Christ’s Procession”. In a very particular moment of crisis the inhabitants of Pove carry the Crucifix on their shoulders and start to walk in procession. That Procession is neither a miracle play nor quinquennial as it will become starting from 1815. We have the first historical mention of a Quinquennial Festival held in Pove in honour of the Crucifix, in 1832. In that year the diocesan bishop comes on a visit to the parish and he is told that the Festival occurs every five years, always on the first September Sunday. But the Festival, which dates back to 1815, becomes more and more important only in the second half of the nineteenth century.In 1885 together with the traditional Procession along the streets of the village there is a very simple miracle play which has a great success. In 1910 the Quinquennial Festival in honour of the Divine Crucifix arouses a great deal of interest thanks to the presence of the diocesan bishop himself. After the break due to the First World War, the Festival resumes with greater fervour. The 1920 edition draws a great audience. By all accounts almost fifteen thousand people are present during the Festival to watch the Procession on Sunday and the festive illumination on Saturday night. The attention of the crowd is engaged, in this first edition after the war, not only by the usual festoons and arches but also by the electric illumination of the church. A huge crowd comes to Pove so as to see that new kind of illumination and in order to listen to the concerts of the local brass band. The Procession begins with the infant Jesus who holds a globe in his hands, Saint John the Baptist and different religious and political representatives with their banners. In the middle we can find the symbols of Christ’s passion, the twelve apostles, the local brass band, the Crucifix followed by the three Marys. At the end we have the clergy with the relic of the Holy Cross, the town council and the inhabitants of the village. There is a crowd of sixty-nine extras. In 1930 the characters are three times as they were in 1920. Nowadays, alongside the religious traditions, we can find a lot of folklore events, such as a lucky dip and many band concerts.